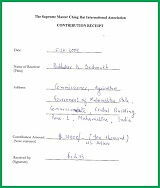 On December 5, Golden Year 6 (2009), the Commissioner of Agriculture of Maharashtra State in India, Mr. Prabhakar Deshmukh, was presented the Shining World Leadership Award by representatives of Supreme Master Ching Hai. The Award recognized the State’s outstanding eco-friendly efforts to promote the health and stability of our environment through wholesome organic farming. To reverse the damage of prolonged chemical fertilizer and pesticide use to both land and farmers, the State Government has approved a fund of 33.5 million Rupees (approx. 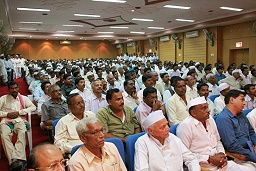 US$743,000) for a year-long project to organize 320 training classes to approximately 6,500 farmers in the state. Once a grower completes the course, they will be expected to allocate at least one hectare of land to this agricultural method. In addition, certification is also being made available for those who wish to export their produce. 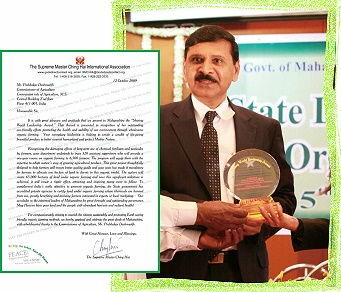 In the Award letter, Master wrote, “The system will create 6,500 hectares of land under organic farming and once this significant milestone is achieved, it will create a ripple effect, attracting and inspiring many more to follow.” Together with the Award, Master also contributed US$10,000 for the government to award the first and the best farmers who convert to the organic method. Our accolades to the esteemed leaders of Maharashtra for your great foresight and outstanding governance. Blessed be all such endeavors to share the wholesome and plentiful benefits of organic vegan farming.